riennynn Finally completed a capote based on designs from the early 1800s! I've been sewing my interpretation of this dress over the past few days, taking photos whenever I remembered. It has ended up quite challenging - I keep looking at pictures and working out ways to copy, wishing I had the actual dress in front of me. I am making two versions of this dress - this one is for a client and was supposed to be sewn by machine. My own version was to be sewn by hand and will be finished afterwards. You can follow past research and progress on my blog. I don't have time to sew the entire dress by hand and wish to use the machine where possible, but I must say that most of it has ended up sewn by hand, and its taking me longer than I anticipated. Preparing the front detail. It was easier to bind before cutting it out. Three more bows to go. Three bows, one to go. 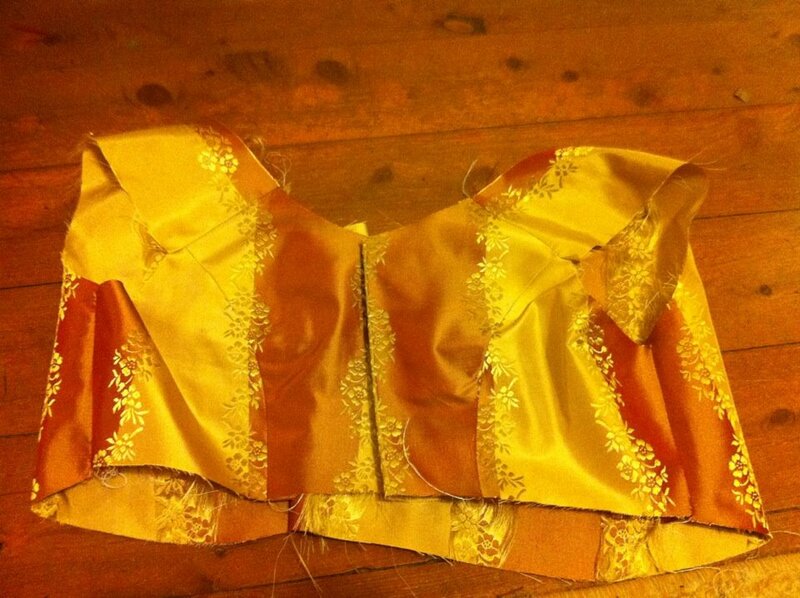 The mannequin is too large so the bodice is not sitting well tonight. Also they were deaccessioned in 2007! "According to the donor, the item was brought from England to the United States around 1831." Seriously how easy would it to be to add a fabric bag (To match your dress) and trimmings? I think the best part is that the straw comes in colors! 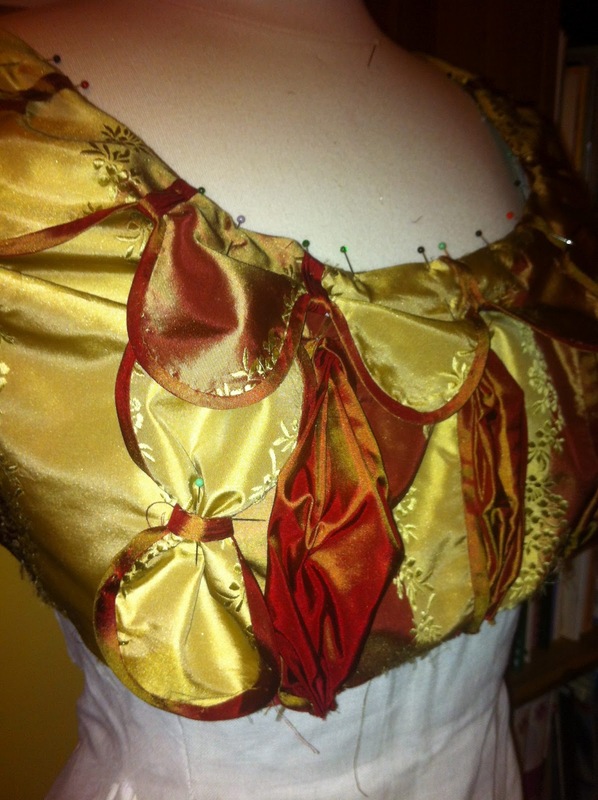 aylwen Aylwen Gardiner-Garden is running a 2-day workshop this weekend in Canberra, Australia, teaching how to make a historically-accurate regency gentleman's tailcoat. For more information go to Regency Reproductions. Included in the costs are refreshments and a copy of the newly-released pattern. 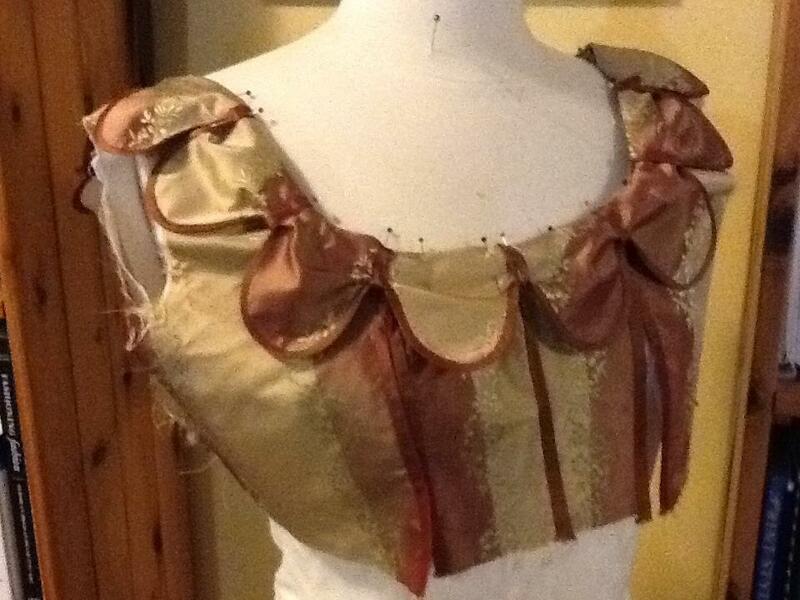 You can read about Aylwen's costuming adventures on her blog, History in my Wardrobe. 2:55 pm - Decorative busk Finished!!! 10:09 pm - 1810 Gown from page 158 of The Cut of Woman's Clothes by Norah Waugh. 5:10 pm - New Regency wear and shoot pictures! There are new items added to the Regency wear page and worn in this new shoot! First off a dress called Eliza made out of cotton with a flower print. Altough you cannot see on this picture, it has a round neckline,puffsleeves with trumpetsleeves and it closes in the back with either buttons or hooks and eyes. The dress is a little longer in the back then the front and has pleats. Worn over the dress is a velvet Spencer with a round collar and a peplum. This spencer has a decorated back and long sleeves with cording and trimming. The spencer closes in front with hooks and eyes and a buckle. The bonnet is made out of straw and coverd with lace ,velvet and satin ribbon. The bonnet can be made upon order. This dress is a French ballgown and inspired by Josephine and as tribute also called Josephine. It consist of an Ivory taffeta dress with beige trimming, a square neckline and closing in the back. Worn over the dress is a mintgreen taffeta train wich closes on the raised waistline with velvet tape and a hook. The train is embellished with blond lace, beige trimming and faux pearls. aylwen It has become tradition for regency fashion to feature at the Jane Austen Festival Australia, and I've just made up the poster for the 2011 festival, with lots of lovely pictures of participants in costume. If you would like to do a regency sewing demonstration, workshop or talk during the festival please let the festival know as soon as possible. 6:09 pm - horizontal stripes? I have some very pretty and very period-looking roller printed cotton that I'd like to use to make a woman's day dress circa 1810-20, BUT it has horizontal rather than vertical stripes. Now, for the life of me, I can't recall ever seeing a striped dress from this period that had anything but vertical stripes. So, has anyone here ever seen a fashion plate or existing gown from this era with horizontal stripes?? And if so, could you direct me to a book or website where I could see one? I thought of just using the fabric sideways, but my mother seems to believe that one should never do that under any circumstances if you want your garment to fit right. Does anyone have any experience in that matter? Does going against the grain really matter that much with plain old cotton calico? I was wondering if anyone could recommend a good pattern for regency stays. I'm looking for something that can be made up in a few days . 9:01 am - Linen Fabric Online? My former supervisor (a super neat lady and costumer) had recommended a great site that had high quality, inexpensive linen. I think it was fabrics-store.com...has anyone purchased from them? I am going to be making a man's regency shirt and neckcloth, as well as a regency shift and was wondering what weight to buy. I've never purchased fabric online before -- it's not easy to figure out how heavy or how sheer something is from a tiny square image on my screen! 10:10 am - Midshipman's uniform for a "squeaker"
last_bloom Although my son is just learning to walk, I would like to get a jump start on research, etc that will help me create a uniform for a young midshipman in the Royal Navy circa 1800-1812. 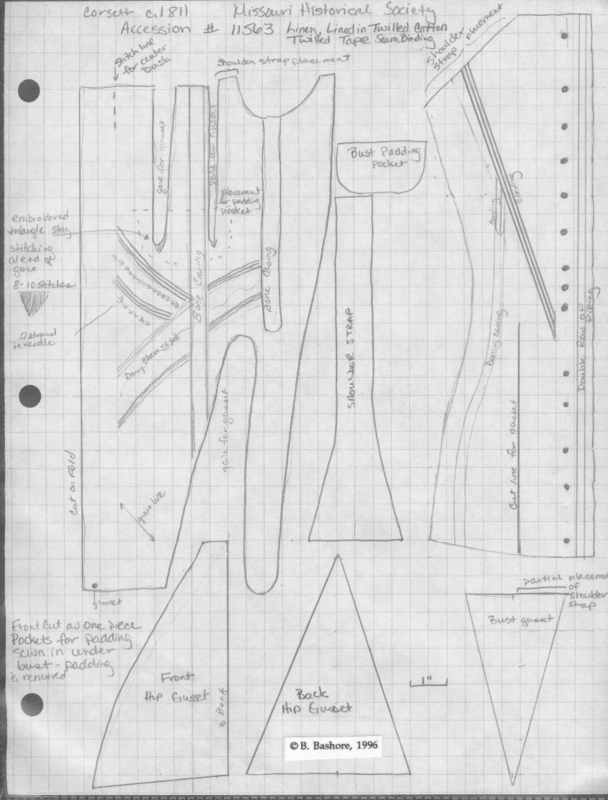 Can anyone suggest books, portraits, drawings, original source documents, or patterns that will help me develop a greater understanding of a midshipman's life in the RN as well as guide me in creating an historically appropriate set of garments? I have an unusual request to make of you all. The Medieval Studies club at Binghamton University is putting together an academic conference on the history of underwear from the classical period to 1750. Tied in to this event will be another, a fashion show entitled "Underwear Through The Ages." We're looking for samples of underwear from the classical period to the present day, particularly 18th century, Regency, Victorian, and Edwardian underwear (for both men and women, preferably as historically accurate as possible.) If any of you have pieces you would like to loan to the university for the fashion show (to be held April 24th, 2010) please email me at hallen1@binghamton.edu. We would pay for postage both ways and insurance on the garments, and your name would be in the program as the owner/maker. We are looking for all sizes. If you think you would be interested in helping us out with this, please let me know! Many thank yous in advance for your help! quindaro My other Mississinewa project, a ball gown for Miss B. Yes, we're using the term 'ball' loosely; dance held in a big tent in the midst of a muddy field is more to the point. However, it did require some fancy new duds, and I posted them in my journal. quindaro I recently made a walking habit for an 1812 re-enactment and (of course) posted it to my journal. Check it out there. My name is Stephanie Coté, and I am the founder of the brand new Georgia Regency Society, a chapter of the Regency Society of America. It has been brought to my attention that the members of this group may be interested in joining us for our events so I am here to introduce us and invite you to be a part of the Georgia Regency Society. We are a group of people who have come together through the love of all things from this era, whether it be the clothing, food, culture, music and dance, literature, or just good company. Our first event is coming up in a few weeks and it's my pleasure to invite you all to join us on December 5th, 2009 for a Regency Costumed Afternoon Tea and Lunch at the Sugarplums Tea Room in scenic Canton, Georgia. For full details and RSVP information please see the events page of our website. If you'd like to RSVP, or have any questions or comments, please direct them to info@garegency.org. Thank you so much, we hope to see you there! fayethefaery I started a Historical Fashions picture blog over on Tumblr today! You don't have to be a member to see the photos, so feel free to bookmark it and check it often - posts are queued and every hour a new photo is posted automatically. If you ARE member of Tumblr, feel free to join and post! Let me know how you like it :) This includes the Regency era along with others - I am using fashions from the Middle Ages all the way up to the 1950s (and occasionally special circumstances for any garments later).